Our most advanced Viscometer, complete with an adjustable rotor, can deliver variable speeds from 0.1 to 20 revolutions per minute (RPM). Thus facilitating extra functionality and producing accurate data on a variety of elastomeric compounds, making this an impeccable choice for polymer specialists. 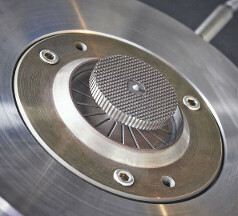 Fundamental is the rotor and die assembly, with the test material placed above and below the rotor, held in place by pressure controlled platens. The temperature of the dies and the sample contained within are accurately maintained throughout the test by means of microprocessor based PID control system. The rotor speed of rotation can be varied from 0.1 to 20 RPM thereby enhancing the range of data that can be calculated during the test. This is a particularly useful function for testing of tyre compounds and polymers. The measurement of Stress Relaxation index of material samples is one important feature that can be achieved with this sophisticated viscometer. As our commitment to you, our Mooneyline Viscometers VS is supplied with everything you need to perform accurate and efficient elastomeric compound testing. The Mooneyline Viscometer VS is supplied with the latest computer hardware, pre-installed with our most innovative data acquisition and analysis Labline software for Microsoft Windows ® OS. Our Labline software controls and operated the instrument, allowing all testing capabilities of a standard Mooneyline Viscometer, in addition to advanced tests at varied speeds and temperatures, in accordance of ASTM D1646. Labline allows unlimited amount of test data points and is complete with a calibration module.